Dragons of Tarkir is a Timmy’s and Vorthos’ dream come true. The definitive dragon set, Dragons of Tarkir contains the highest number of dragons we have ever seen in a Magic set and by extension also the highest as-fan of dragons. And as if that was not enough, we were spoiled with the return of the Elder Dragon subtype, one of the most iconic creature type in Magic. They were the progenitor of the Commander format, and they were integral characters in early Magic lore. Well, modern Magic lore as well, if you consider Nicol Bolas an Elder Dragon even after his planeswalker spark ignited. The excitement surrounding the introduction of five new Elder Dragons was palpable. Elder Dragon was a rather rare creature type, appearing in only five cards throughout the twenty-two years of Magic’s existence. There are more Gods than there are Elder Dragons in the Magic universe. As you can see, I am not particularly fond of Dragonlord Atarka. Standard: Dragonlord Atarka is the Magic dictionary’s definition of clunky. Yes, her enter the battlefield trigger will take down at least one creature in the current metagame of Siege Rhino, Tasigur, the Golden Fang, Polukranos, World Eater and Stormbreath Dragon. She may even take down a relatively fresh-on-the-board Elspeth, Sun’s Champion, or a ticked down Ugin, the Spirit Dragon. However, if you are going to tap for seven, you would want more than just a two-for-one. Think Hornet Queen, who usually nets you at least a three-for-one, or at least turn the tides and stabilize your board. Dragonlord Atarka could stabilize your board by taking out a creature and being a 8/8 blocking body, but her board presence is less resilient than Hornet Queen. Dragonlord Atarka is one mana cheaper than the iconic Bogardan Hellkite but her enter the battlefield trigger does not target players. Which is a shame, because you could not finish off opponents merely resolving a Dragonlord Atarka. It waits to be seen if Dragonlord Atarka will see play side-by-side with Frontier Siege as Cedric Philips proposed in his article spoiling Dragonlord Atarka. Modern: Don’t even think about it. You can’t even Dragonstorm Dragonlord Atarka for the win. Not that Dragonstorm is a deck in Modern anyway. Commander: Her rare version was more interesting, as /r/EDH noted. I concur with them; I would rather have a seven mana commander that renders my dragons double strike (Thundermaw Hellkite for ten). 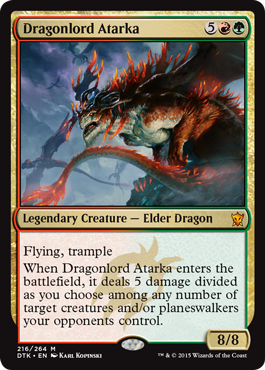 Plus, Dragonlord Atarka’s enter the battlefield trigger of five damage is nothing to fete about in Commander games. Verdict: Dragonlord Atarka is what happens when you attach a pair of wings on Hodor. Or give him a can of Red Bull. Dragonlord Atarka’s price would drop from her preorder price, and experience a slow rise through the years buoyed by casual demand. Invest in foils if you are looking to make some long-term dough off Dragonlord Atarka. Dragonlord she may be, Dromoka still does lookout duty from time to time. When a card was spoiled in the Mothership’s Command Tower column, it probably makes a good commander. Standard: Dragonlord Dromoka may be the second most playable Dragonlord in Standard. An uncounterable 5/7 flying lifelinker for six mana is already playable as the top-of-the-curve for GW decks or even Abzan decks. The Grand Abolisher clause is mere icing on the cake. I imagine the opponent can’t cast spells during your turn ability to be not too useful when you hit six mana most of the time except maybe that time where your control opponent has no answer to Dragonlord Dromoka for a few turns. Her 5/7 flying body walls the majority of popular creatures in the metagame, and with lifelink, she could turn the tide when you are behind in board position. True to her clan’s roots, Dragonlord Dromoka is the epitome of grindy. Imagine Siege Rhino and Dragonlord Dromoka in the same deck. Modern: Dragonlord Dromoka has the makings to cut it in Modern, but her six casting cost makes her chance slim. A resolved Dromoka could block Tarmogoyfs, Tasigurs and Lingering Souls all day long and turn the tide of grindy midrange mirrors with her lifelink, but tapping six mana for a threat vulnerable to Path to Exile is setting yourself up for tempo loss. If she does see play in Modern, she would probably be a one-off in the sideboard of midrange decks or Zoo variants. Commander: Here’s where Dragonlord Dromoka truly shines. Dragonlord Dromoka excels both as a commander and one of the 99. The two most popular GW commanders as of writing are Captain Sisay and Karametra, God of Harvests. Being legendary herself, I have a feeling Dragonlord Dromoka would be an auto-include in Captain Sisay decks as a tutorable hatebear hatedragon with upsides. 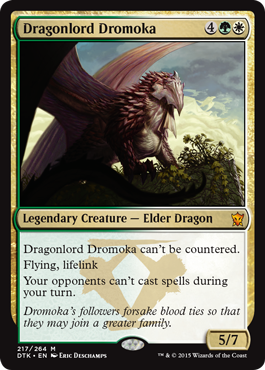 I do not play a lot of multiplayer Commander, so I can’t tell if Dragonlord Dromoka is better than Karametra as a multiplayer commander. To be fair, they both cater to different builds. Besides ramping, Karametra decks could abuse the top of their decks with Karametra’s ability to trigger a shuffle. A Dragonlord Dromoka deck have me giddy at the thought of resolving an uncontested Genesis Wave or any of the GW hard lock combos available. Verdict: I am excited about Dragonlord Dromoka both financially and as a player. She has cross-format potential and could be one of the Dragonlords to end up with double-digit figures in the medium to long-term. 1 month: $8 – $10, up to $15 if she sees significant play during Pro Tour Dragons of Tarkir. I’m keeping an eye for foils of Dragonlord Dromoka when foils drop to slightly above $10. The current price of foil Narset, Enlightened Master, one of the most popular commanders from Khans of Tarkir which will be opened more than Dragons of Tarkir (and presumably redeemed more as well, because foil fetches) is $10 – $12 right now, and with Dragons of Tarkir opened less, I would imagine foil Dragonlord Dromoka to drop to a slightly higher price at peak supply. The cheapest of the Dragonlord in preorder price, Dragonlord Kolaghan was the most difficult to evaluate using theorycrafting. She could be decent, or totally crap. At best, Dragonlord Kolaghan turns a few cards in your opponent’s hand into dead cards, that is until they draw into their Hero’s Downfall, Murderous Cut, Chained to the Rocks or Valorous Stance. Without testing her out in real life, it is difficult to evaluate how triggerable her target opponent loses ten life clause is. Theorycrafting alone says that it would not be that often: it’s not often that control opponents resolve the same planeswalker twice, and the creature clause works best against creature-centric decks, but you don’t really want a six drop against those decks. Plus with the prevalence of Delve, you opponents could easily Delve away creatures in their graveyard to fuel a Murderous Cut. Standard: RB is not a color combination that sees much play in the current Standard meta and unless an aggressive RB shell becomes a thing in Dragons of Tarkir Standard, I am pessimistic about the financial future of Dragonlord Kolaghan. Plus, she gets picked out by fellow Dragonlord Atarka. Commander: Dragonlord Kolaghan seems to be designed with Commander in mind. Verdict: I am tempted to put down Dragonlord Kolaghan as a bulk mythic. The only format she has any chance to make a break in is Standard and even if she does, she would unlikely be a four-of. Long-term: $5, on the merit of being an Elder Dragon. I am not even sure if foil Dragonlord Kolaghan are good investments. Maybe if you can get them at bulk price, but she is an Elder Dragon and kitchen table demand may prevent her foil prices from descending to bulk. It’s a bird…it’s a planeswalker…it’s Ojutai? Dragonlord Ojutai has my vote as the most undervalued Dragonlord. True to his clan’s reverence of cunning, Dragonlord Ojutai is one of those cards that would probably turn to be much better than he looks once we get to play with him in our decks. You can jam out Dragonlord Ojutai on turn five with impunity, knowing well he would survive to the next turn barring an End Hostilities or Crux of Fate. You can untap the turn after and have removals or protection up as you ride Dragonlord Ojutai to victory. In the right build, I doubt it would be hard to connect once or twice with Dragonlord Ojutai to reap his value. Standard: There are so many archetypes Dragonlord Ojutai could find a home in. He looks to be a good curve-topper for Jeskai burn where you could protect him with counterspells and clear the skies with burn to ride Ojutai’s value train. Dragonlord Ojutai has synergy with Jeskai Ascendancy, and while the interaction looks cute, I am wary of discounting any Jeskai Ascendancy interactions as Jeskai Ascendancy has proven over and over again during Khans of Tarkir Standard that it is a powerful value engine that fits in a swath of Jeskai builds. On a side note, you also get Vorthos points for the irony of running Dragonlord Ojutai in a Jeskai deck. Dragonlord Ojutai could also find a perch as a finisher in UW or Esper Control decks. His mini-Brainstorm Ponder trigger digs you more gas, answers or Dig Through Time. I do not know if Mono-Blue Devotion would be as viable as hyped once we enter Dragons of Tarkir Standard, but it would not be far-fetched to imagine Mono-Blue Devotion splashing white for Valorous Stance, Ephara, God of the Polis or Dragonlord Ojutai. If needs be, Dragonlord Ojutai is able to trade with Siege Rhino and Tasigur, the Golden Fang. He is also the only Dragonlord immune to Dragonlord Silumgar’s charisma, which may be useful in control mirrors. Speaking of which, control mirrors may be a matchup where Dragonlord Ojutai excels as a pesky threat. Unfortunately, Dragonlord Ojutai does not fare well against Stormbreath Dragon and if there is a factor that represses the playability of Dragonlord Ojutai, it would be the pervasiveness of Strombreath Dragon. If that happens, I wouldn’t fret. Remember when Thundermaw Hellkite was cheap because he was unplayable in a Vapor Snag and Snapcaster Mage Standard? 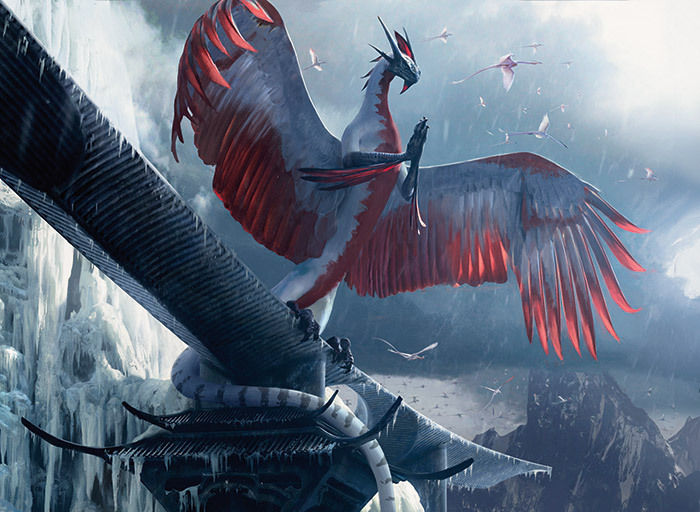 Modern: Dragonlord Ojutai’s five casting cost puts him at the fringe of Modern playability. UW is not really a thing in Modern and I imagine Jeskai builds would rather run Keranos, God of Storms, or just plain Stormbreath Dragon over Dragonlord Ojutai. 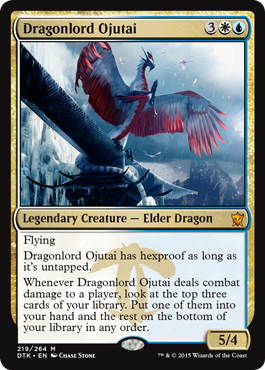 Commander: Dragonlord Ojutai has the potential to be a control or stax commander, being relatively cheap and having in-built protection which plays well with the veritable selection of enchantments and artifacts that grants vigilance. It would also be easier to trigger Dragonlord Ojutai’s ability in a multiplayer game. Verdict: I think Dragonlord Ojutai is tied with Dragonlord Silumgar as the most playable Dragonlord. He is chock-full of potential in Standard and is Commander-playable. Long-term: It depends on how popular Dragonlord Ojutai is as a commander and if anyone breaks him in Modern (what are the odds? Low in my opinion). Dragonlord Ojutai is one of the few cards I am preordering. It baffles me that he is preordering for less than Dragonlord Atarka. From Reddit: Draw me like one of your Dragonlords. Reid Duke ran a good piece analysing Dragonlord Silumgar last week (his verdict: 7/10). I wrote extensively about Dragonlord Silumgar in my previous article (mainly praises). Without rehashing too much from both articles, Dragonlord Silumgar is easily the best of the Dragonlords. Standard: UB and Sultai Control are obvious homes for Dragonlord Silumgar. Whether he belongs in the sideboard or mainboard is more contentious. I am of opinion Dragonlord Silumgar is good enough to see mainboard play. Dragonlord Silumgar stabilizes the board with his Charisma trigger and five toughness which allows him to wall Siege Rhinos, Tasigurs and Stormbreath Dragon all day long. Not that they usually come back for a second encounter seeing that Dragonlord Silumgar has deathtouch. Due to his very convenient three power, Dragonlord Silumgar is the only Dragonlord who does not die to Elspeth, Sun’s Champion. Dragonlord Silumgar excels in control match ups as well, being an answer to opposing planes walkers that would steal the game if your opponent does not have an answer to Dragonlord Silumgar in return. Or conveniently ultimating your opponent’s planeswalker, but I imagine players would be playing around that possibility shall he becomes a mainstay of the Standard meta. Modern: Sower of Temptation barely sees play in Modern and Sower only costs four. I doubt Dragonlord Silumgar would cut it in the current Modern meta where Path to Exile is so pervasive. Perhaps if the meta shifts towards less Path of Exile, Dragonlord Silumgar may have a chance, but I highly doubt it. Six mana is prohibitive unless it’s a Primeval Titan. Commander: In my previous article, I mentioned that Dragonlord Silumgar seems to be designed with Standard rather than Commander in mind, but better Commander minds think Dragonlord Silumgar may have a spot as one of the 99. I can’t argue with that. Come to think of it, stealing big creatures or opposing Jace, the Mind Sculptor, would be quite fun in Commander. 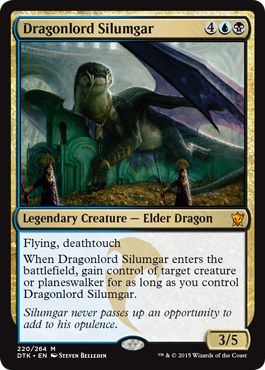 Dragonlord Silumgar is just not cut as a Commander himself. Verdict: Dragonlord Silumgar, alongside with Dragonlord Ojutai would probably be the two Elder Dragons that see the most play in Standard. 7/10 in Reid Duke’s assessment is a pretty good, and I would venture to say Dragonlord Silumgar looks to be pushed in design. Long-term: Dragonlord Silumgar will probably maintain a mid $10s price tag through the majority of his Standard life. Dragonlord Silumgar is a fine preorder if you want to play with him. While I think Dragonlord Silumgar has potential in Standard, I doubt he would be a four-of like Whisperwood Elemental, which is currently $14. Also, a Dragonlord who wears the highly playable Tasigur as a necklace can’t be bad right? Regardless of how much play they see in Standard, the Dragonlords will be casual hits. Kitchen table demand may actually be a strong driver for the price of the Dragonlords due to their immense casual appeal. Casual demand is the invisible hand (I am totally misusing Adam Smith’s term) that drove up the price of angels and dragons and I would imagine the Elder Dragons to be the primary chase cards among the kitchen table crowd. The kitchen table is where Dragonlord Atarka and Dragonlord Kolaghan have the best chance of being a hit. Dragonlord Atarka is the embodiment of the ultimate Timmy dragon. Kitchen table players are more likely than spikes to attempt abusing Dragonlord Kolaghan’s very situational ten damage clause. It baffles me as to why Dragonlord Ojutai is one of the cheapest Dragonlord to preorder. Perhaps his prowess on the board would be better than what he looks like on the computer screen. If the price trajectory of the foil Avacyn Restored angels – Avacyn, Gisela, Sigarda and Bruna – are anything to go by, Dragonlord foils would make for good long-term investments due to their immense casual and Commander appeal. Of course, the month or two after release is not the best time to amass your foil Elder Dragons. Wait for Dragons of Tarkir to hit peak supply when Magic Origins is release when Dragons of Tarkir would have been drafted for nearly four months and redemption is in full swing. In my previous article I mentioned that Dragons of Tarkir – Fate Reforged would ‘grind to a halt when Modern Masters 2015 is released’. I may be wrong about that. While Wizards is ramping up the print run for Modern Masters 2015, the price of one Modern Masters 2015 pack would be three times the price of a Dragons of Tarkir booster pack. I don’t imagine the casual crowd to switch over to just drafting Modern Masters 2015 for the month between the release of Modern Masters 2015 and Magic Origins. I suspect the supply of Dragons of Tarkir card would still trickle into the market after the release of Modern Masters 2015 and would only grind to a halt except for redemption once Magic Origin comes out. Comments are more than welcomed, drop one below or catch me on Twitter at @theguoheng. Till then, may the Dragonlords be with you. Edit: An earlier version of this article cited that Dragonlord Silumgar does not die to Valorous Stance, which is not true. A reader pointed out that Valorous stance actually checks the creature’s toughness, not power. My bad. Running foreign language copies of Valorous Stance in my deck, I’ve always read it as “Destroy target Siege Rhino or Tasigur, the Golden Fang”. This is the same partially complete article posted and pulled a few days ago. A little more to it, but it still feels unfinished. Hi Jamie, I apologize for the leaks! I tried to hype things up Apple-style, but it seems that I’ve failed miserably. On a serious note, I really do apologize for that. It was a slip in professionalism on my part and it shall not happen again. Thanks for pointing it out, I took it down when I received an email notification that my supposed-to-be unpublished article received a comment…. The Theros gods were printed in a fall set that was drafted in much larger quantities than Dragons of Tarkir will ever be, which is why the Theros gods were as cheap as they were during their heyday in Standard. While the Dragonlords’ impact in Standard is a contentious topic (sorry, I am on the camp that they will change the face of Standard!) another big driver for their price would be Commander and casual demand. They pretty much rank as some of the most badass creatures ever and I imagine their casual appeal would be off the charts. I mean Dragonlords that are also Elder Dragons!? Dragonlord Kolaghan would be rather pointless in Commander; especially considering the fact it’s a singleton format, eh? Haha, that one line was a bit of sarcasm on my part. I kind of wish Kolaghan was designed to be playable in Commander. At least she would have a redeeming quality to save her from the bulk bin. I didn’t pick up the sarcasm at all and thought that line was a mistake. Looks like I’ve failed as a humorist! I shall stick to serious writing. I typically really like your articles and insight, but I also think you are way over valuing the prices of these dragons (although a good amount of your playability analysis seems dead on but none of these are eternal playable). I think the Theros Gods are the wrong comparison…Born of the Gods seems much more appropriate and accurate as this set won’t be as rare/unopened as the Journey Gods with Athreos, Keranos, etc. I don’t think Atarka is worth anyone’s money…I’m baffled by the presale price as well. 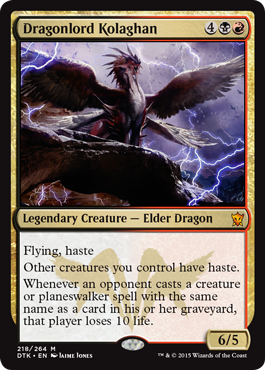 Kolaghan has to be the most disappointing design for commander players ever…an unplayable Elder Dragon in Commander seems terrible. I digress though, back to your price predictions. I think these dragons will follow the way of the BNG Gods and if playable in Standard a bit better. Your price predictions are at worst double what I think they will be; so my question is does the “Elder Dragon” creature type really double the value of these minimally constructed playable cards (none for modern, none for legacy, maybe 3 for standard play, and Dromoka seems like the only solid Commander)?? I do think Domoka has some potential in that new GW Mastery of the unseen deck …but when nykthos, courser, polukranos, voyaging satyr, and caryatid all rotate she might be left without a home and that’s when I was considering picking her up. You have made me reconsider Ojutai by comboing with Jeskai Ascendancy. Maybe after Stoke and Stormbreath rotate that could be a thing. Silumgar seems like a very fun casual card but Standard playability is going to be very meta and removal dependent. It’s interesting that you thought my valuation of the Elder Dragons were too high. When I was writing the article, I was afraid that I may be undervaluing the playable ones. The BNG Gods are certainly good parallels and I agree with you that there is a risk with pinning too much value on the Dragonlords on the merit of them being Elder Dragons, especially when they only have a slim to nil chance of seeing eternal play (oh well, no Keranos’ price level I guess). However, while the mythic gods were supposedly something that appealed to the casual and Commander crowd (wow factor, according to MaRo in one of his podcast episodes) I would imagine Elder Dragons to have more appeal, as dragon is the most popular creature type (again, citing MaRo) and you don’t get more dragony than being an Elder Dragon and a Dragonlord. Another reason why I attributed a significant amount of value to Elder Dragons/Dragonlords was the fact that I totally undervalued the Avacyn Restored Angels and the power of casual demand in driving up prices of casual hits. And the Avacyn Angels were worse off than the Dragonlords as most of them weren’t even Standard-playable. I’m with you Spencer. I am pretty disappointed that barring Dromoka, most of the Elder Dragons would not make good commanders. I was looking forward to having a Dragon Commander I could be proud off (Scion of the Ur-Dragon is not really a Dragon) and is actually good enough for Standard play. A Dragon commander with sufficient depth to tinker and develop over the course of a few years. Trawling through r/EDH and reading Commander articles from more esteemed Commander minds, the Elder Dragons may not be as unCommanderable as I thought. Kolaghan is definitely out, but there were people talking about abusing Ojutai with the myriad of vigilance enchantments in Commander and Silumgar may fit well as one of the 99 in certain builds. Can you analyze these cards for pre-release worthiness? As in financially or to play during your prerelease? To play with. Also for draft. To be honest, I am probably the least qualified person to review limited play for those cards, having accrued a grand total of 1 KTK sealed, 2 KTK drafts, 0 FRF drafts. Would love to hear what you have to say about the other dragons of the set and the commands also. Atarka – I think you’re close. Do remember that at the prerelease, each player gets to choose which of these Dragonlords they receive in foil. Her long term casual demand should fall to $3 or less. Dromoka – I’d rather run Sigarda for modern. Grand Abolisher covered not only spells, but activated abilities too. I’ve never seen these suppressive abilities become a gold mine. Reduce her peak and long term casual demand to less than $5 ea. Kolaghan – You’re on the money. Ojutai – I agree in your assessment that he’s exceptionally playable. Your price prediction, however, is assuming he becomes a four-of in the best deck in standard (like you said in your article, even Whisperwood Elemental is only $14 and he’s maxed out in standard in terms of playability). For realism and safety, cut your prediction prices for him by half. Silumgar – It looks like you did most of your homework on this guy. I’d shave your prediction prices on time by about half ($5 for standard and falls below that for long term casual). The reason why I think his standard price may hold is because he will be a constant threat to the planeswalkers in Origins. I look forward to your next article. See you then! EDIT: I have no idea what I’m talking about. People don’t get a free foil Dragon at the prerelease. Scratch that. I am valuing the Dragonlords higher than I would had they not been Elder Dragons and Dragonlords (but functionally similar) based on their immense casual appeal and the fact that Dragons of Tarkir would only be drafted for about three months plus (I do imagine Dragons drafting would be reduced, but not to a halt yet, when Modern Masters come out). I may be placing too much value on their Elder Dragon appeal, but then again the Standard and Modern-unplayable Avacyn Angels retained quite a high price for a few months after release, and the Dragonlords are actually Standard playable. Good point on Silumgar being a threat to the upcoming Magic Origins DFC planeswalkers, which I’d imagine would be popular. Maybe Silumgar is meant as a preemptive safety valve. While we may digress on his price point, I agree with you that Silumgar’s price may hold because of that. You have stated that Dragonlord Kolaghan seems like a Commander card.